This foray into the mycology of Chinese traditional medicine was written by a student in our Cornell class, Mushrooms of Field and Forest. For 7,000 years, mushrooms have been used in traditional Chinese medicines. One mushroom in particular, Ganoderma lucidum (known as Ling Chih in China and Reishi in Japan), has been used extensively to treat a variety of conditions from insomnia and arthritis to hepatitis and cancer. 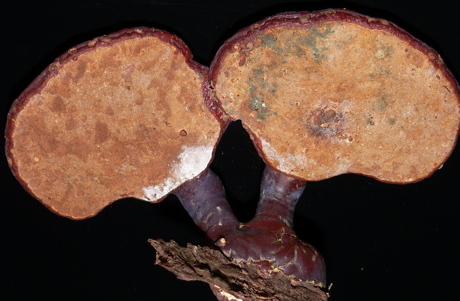 A related species, Ganoderma tsugae, is believed to hold medicinal properties as well. Both G. lucidum and G. tsugae belong to a large group of fungi called polypores. Distinguishing this group are the tubes on the underside of the fruiting body, in which spores are produced. Each tube ends in a tiny “mouth” called a pore, and a fruiting body includes many hundreds or thousands of pores that discharge countless brown spores. Polypores are a diverse group and are also known by several common names such as shelf fungi, bracket fungi and conks. Ganoderma tsugae (below) has a distinct, shiny appearance and is often called hemlock varnish shelf for obvious reasons. The upper surface is a dark reddish-brown and so shiny that it looks varnished. Shaped like a giant, furrowed kidney bean or fan, the cap can grow from 5-30 cm wide. Usually one stalked fruiting body is found growing from a single attachment to the host tree, however sometimes two can grow from one base, as pictured. The undersurface is tan to white in color and has the appearance of suede leather (in our photo, the green stuff is a mold growing on the spent pore surface–the specimen’s a little past its prime). A hand lens reveals the fine pores. The stalk when present is usually attached laterally and is 2.5-15 cm long, 1-4 cm thick and also reddish brown and varnished. Ganoderma lucidum and G. tsugae have a very similar appearance. One of the simplest ways to tell them apart in the field is by noting the species of tree to which they are attached. As the name implies, hemlock varnish shelf, G. tsugae, prefers to grow on hemlock. Ganoderma lucidum prefers hardwood deciduous trees such as maple and oak. This can be a problem for foresters, as these fungi will rot valuable trees. Fortunately for those who seek to gather large quantities of these fungi for medicinal purposes, G. lucidum can be cultivated. A Japanese man, Shigaeki Mori, has figured out a way to grow them in plum tree sawdust. His efforts have lowered the cost and made them more available to people who wish to benefit from the fungus’ healing properties. Finding information on the medicinal use of G. lucidum is quite easy–internet sites abound. This student recommends Medicinal Mushrooms, An Exploration of Tradition, Healing & Culture, by Christopher Hobbs. Because they are closely related, G. tsugae is thought to have similar medicinal value. Numerous studies have looked at the hemlock varnish shelf for its antioxidant properties, its ability to heal skin wounds, and its potential use in therapy for cervical cancer. Research continues, but many Chinese already use a preparation of G. lucidum on a daily basis to promote good health. Reishi has been officially listed as a treatment for cancer in Japan. The medicinal properties of Reishi are gaining popularity in the United States. Ganoderma products are widely available in health food stores, drug stores and from Chinese herb dealers on the internet. Bessette, A.E., Bessette, A.R. and Fischer, D.W., Mushrooms of Northeastern North America, 1997, Syracuse University Press, New York. Hobbs, C., Medicinal Mushrooms, An Exploration of Tradition, Healing & Culture, 1995, Botanica Press, California. Lincoff, G. National Audubon Society Field Guide to North American Mushrooms, 1981, Chanticleer Press, New York. Antioxidant properties of methanolic extracts from Ganoderma tsugae, Taiwan, downloaded 10/20/2006. Sacchachitin, a skin wound dressing material from Ganoderma tsugae, Taiwan, P-INCOMM-12, 608B2E99.doc, downloaded 10/20/2006. Screening for Anti-human Papillomavirus Activity in Ganoderma tsugae, Thailand, P-INCOMM-46, B81F1AF8.doc, downloaded 10/20/2006. Editor’s note: The Ling Chih mushroom is one of the only mushrooms I can think of that is a hero of a famous Chinese Opera, Legend of the White Snake. In this opera based on an ancient folk tale, Madame White Snake must obtain Ling Chih from the Gods. She needs it to save her husband, who has understandably been startled to death at the relevation that his wife is a big white snake. Here’s the story direct from China, and interpreted and illustrated by Aaron Shepard for kids. I enjoyed this post. I have heard many times about the reishi being officially listed as a treatment for cancer in Japan but I have never been able to find any listing to show it. Do you know of a reference where I can verify this information? Hi Harry, In his book Medicinal Mushrooms, Hobbs says “The Japanese government has officially listed reishi as an adjunct herb for cancer” and he cites T. Willard, 1990 (Reishi Mushroom. Herb of Spiritual Potency and Medical Wonder. Issaquah: Sylvan Press). I haven’t seen this myself, but it seems a good place to begin. Could you please explain in greater depth the uses of G. tsugae. Living in the Pacific Northwest I have found these mushrooms and would like to make use of them. I have taken Reishi (G. lucidum) for years with great results but I cannot harvest Reishi myself. How different are these mushrooms. I came across this site after discovering G Lucidum in central France. I cannot find any information on the preparation and application of this medicinal fungus. do you have any Idea of references. First, try the Christopher Hobbs reference above (Medicinal Mushrooms) for preparation instructions. 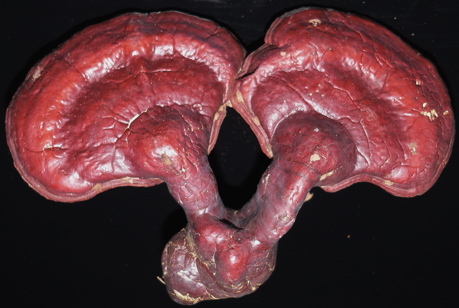 In general, Ganoderma lucidum and G. tsugae are used interchangeably. Organoleptically, the two are very similar. The basic preparation is to combine a tea and a tincture of the fresh or dried fruiting body. The tincture is approximately 1:4 in 80% ethanol (sometimes double macerated; soaked at least two weeks). The menstruum is then combined with more chopped fungi and heated for 1 to 4 hours as a decoction. I found a bunch of Ganoderma Lucidum and wanted to make a tea out if …Does any know about proportions? how much mushroom per ounces/cups of water? Thanks!! Please note that there are differences in terms of ingredients and efficacy between wild Lingzhi and cultivated ones. Pesticides is a big concern for most doctors and acupuncturists, cultivated Lingzhi invariably contains certain levels of pesticides, while the true wild Lingzhi, grown and harvested from high mountain forrest has slightest level or none. Visit http://www.naturespeed.com for more information on the comparison. First, make sure it IS real ganoderma instead of poisonous fungi. Secondly, to consume it as tea you need to grind or shred it into little tiny chips or in powder form. We suggest to use 5g of the powder with 3 cups of hot water if you just want to maintain your health vs. cure diseases. Do not drink the powder, only the tea water. Please visit http://www.naturespeed.com for more details. will get the book , but in my area I have had no good fortune in finding the mushrooms in my area. Is there a safe, legitimate source of the final product that I could purchase? It is my opinion that herbs etc are the one true source for healing and maintaining health. not the large drug companies. I am a mushroom newbie. During my first harvest I notice a hard stump which is left embedded on the substrate. Do I have to pull it out too.